I could file this under: Can I Kill My Husband Now? Apparently he became an expert on canvas water bags when my back was turned. When we started collecting them he was as baffled by their use as I was but he apparently doesn’t remember that. Or maybe I remember events differently than he does. That’s very likely. I get a thought in my head and that colors all my memories. So maybe I am not mad at my husband. When I originally posted about our little collection of canvas water bags, I asked how to use them because they drip (and I had it in my head that they were not supposed to drip). To use them properly they have to be soaked for a couple of days in water. This swells the fibres and seals the bag. The water does seep out but a full bag should last a week if not drunk. The water should be changed regularily anyway. I have one on my Ute and the water quite easily lasts a few day. The bag should not drip but have a damp surface to work correctly. They are some good examples. 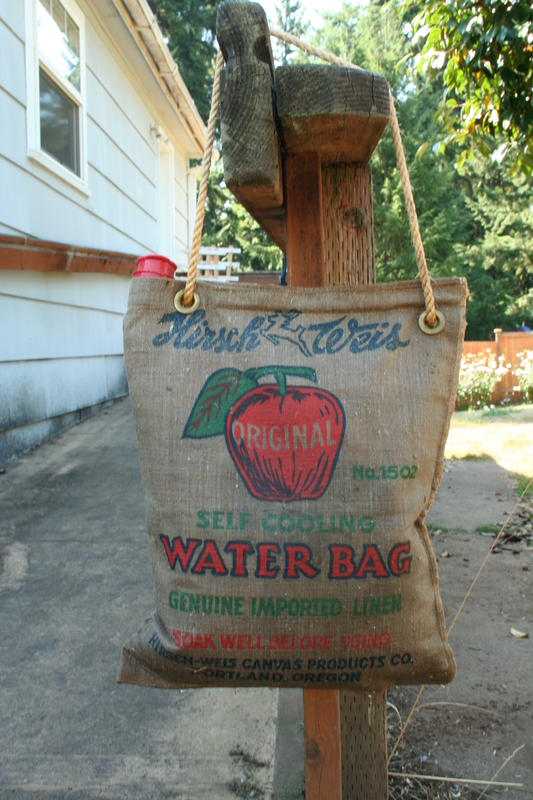 I have used desert water bags for years. So has the U.S. military (and no doubt militaries in other countries). You can soak it before use, in hot or cold water (hot might cause the cotton to shrink though), but you don’t have to. You can fill a dry bag with water. It will leak a bit at first, but as the fibers swell, the leaking will diminish. After a while (one to several hours), the leaking will stop but the bag will remain damp — and COOL, which is the intended behavior. As long as there is water inside, and as long as the relative humidity outside is low, the evaporation will remove heat from the water inside which will keep it cool. The hotter, drier, and windier it is on the outside, the faster the rate of evaporation and the colder the water will get. But when the evaporation rate is faster, the bag needs to be refilled more often. I have lived for a month or more out in the desert, far from electricity, and enjoyed cool water by maintaining two bags: one for receiving incoming, non-cool water, which is then used to keep the second bag full at all times. The second bag will eventually concentrate any minerals in the water, due to evaporation, leaving mineral solids behind. So the second bag gets dumped and rinsed every so often. And now you know how these bags can be used for a practical purpose. And nearly two years later, I decided to test out the different instructions. I picked one bag and filled it with water on the hottest day of the year (the hottest day in nearly 365 days, mind you). It dripped and dripped and slowly, slowly, slowed on the drip-drip-drip. I think it held water for about 6 hours. On day 2, the fibers were still wet and swollen so I refilled it. It did drip a little bit. A very little bit. And it held water for 8 hours plus (I quit checking after 8 hours). Then I did the unthinkable. I decided to TASTE it. Yup: taste the water from an old canvas water bag. It didn’t taste too bad. Not too musty. Maybe a little like burlap. But, really, not too bad. If you were in the desert and hot and thirsty, I think it would taste outright wonderful. Anyway, I now have a new skill: I know how to use a canvas water bag. if we’re ever stuck in the desert together, I will bring the water in canvas water bags. *shakes head* Jaci. . . .? what next. I’d like to know where you’re finding these! I’d love to have one just to remind me of dad. I’d like to see a photo and how much do you want for it? I don’t know if Jodi will see the follow-up comment but I’d definitely pass it on to her (she’s one commenter that I actually know in real life). So – there’s a story behind it? I would pay $10 for the story and the bag (I don’t have pay pal, however). If you are interested in selling it to me, I’ll reply to your yahoo email addy privately. I remember these bags when I was in the Mojave desert. I would like to buy a water bag. Can you tell me who makes this item? Is there a website I could go to or a manufacturers name on the bag? I am really interested and any help you cna give me will be greatly appreciated. Is there another name for Water bags that hang from the hood ornament? When I bought one in the store when I was in the Marines at desert warfare training at Death Valley it simply said “Canvass”Drinking Water Desert Bag…right across the front of it stitched into the bag….I guess the simple things sometimes truly are the best inventioins! I spent 10 years in the Marines before getting out in 2009 on a medical discharge but our unit used to deploy to 29 Palms California (Death Valley) 2 sometime 3 time a year for a month long desert warfare training excercise call C.A.X. and the military store (The P.X.) on Camp Wilson and when I first saw these things in June of 2000 I remembered it was a piece of gear that was reccomened to us by the people who ran the base, and since June in Death valley sometimes excessed 120+ degrees I picked this thing up for about 12$ (and it was authentic) canvass,twine, hand stitching…the whole bit! Plus the topping on the cake was it was MDAE IN THE U.S.A., Anyway I read the instructions to soak it (filled) for 2-4 days in order to stretch the fibers to build up the water[proofing] and ill be damned if on the hottest days out there I didn’t always have a COOL drink of water! Anyways, anyone who camps in low to zero humidity conditions and hot climates I reccomend these bags ANY DAY OF THE WEEK! We used to hang the bags off of the side mirrors of our humvees when we would go training and the breeze would quickly chill the water. Best of luck to all who get them….God Bless and remember the 7 P’s : Prior Proper Planning Prevents Piss-Poor Performance. My nephew, Jerad, is in the Marine Corps and stationed in San Diego (or near there). Only the first four are actually water bags like I have. I paid between $5 & $10 for the ones in my collection & probably wouldn’t pay any more than that if I come across more at a yard sale. But I am a dirt cheap yard saler and you’d have lot more luck on ebay getting some $$ out of your finds. Good luck!! Hi, interesting post, I am in Victoria Australia I have a 1927 chev ute and as part of the history I thought an old water bag would be a nice addition. Colleagues I spoke to said “don’t waste your time they are all rotten and gone”. I got carried away and now have 30, 1 dating back to the 1930’s most hold water. They have porcelain tops with corks, porcelain tops with a tin screw cap, plain glass screw top and brown glass screw top. They have a variety of makers and styles and water bags were first used in Australia in the late 1800’s. I have only 3 or 4 with glass screw tops they are not that common. I have collected them over the years from various sources, swap meets, junk shops etc. To my surprise most of them have only a hand width handle and these would have been used by shearers, farmers etc and hung on a shed wall or post while they worked. I have only a few with enough width to hang on my bumper bracket. Interestingly very few museums/motoring museums have examples of the bags and there is not much information on them. The small museum at Silverton, Broken Hill has one. I do have a brand new one from the USA still in its wrapping I picked up In Wagga NSW apparently from the 1960’s. It is important after getting it wet it is thoroughly dried and stored in a dry area so it doesn’t rot. Since my last post a friend brought me back one from the USA It looks like 1940’s in good nick intact and good graphics she got it at a flea market. on January 12, 2014 at 23:36 | Reply Bruce Hogan. Hi there everyone, I grew up in Wagga Wagga, in the early 50’s. We always had a canvas water bag or two hanging on our verandah. When i went to work as a child with my father in the timber mill there was a long cylindrical water bag with a wooden tap the water always tasted fantastic & cool. Recently I have purchased a new water bag made by Supex here in Australia. I am having a bit of a problem with mold, I feel that it is because where we are just outside Sydney the relative humidity is much higher than the inland humidity. The water still tastes good but it has a slight moldy taste. There is also what appears to be black fungus on the outside of the bag. Does anyone have any suggestions to prevent the mold growth & to remove it from the canvas bag. It does not leak, I soaked it totally submerged for 3 days with a brick on it to keep it under, filled it & it has never leaked. I think I would get rid of it due to the black mold, but that’s just me. Maybe someone else sho has commented will have an idea. This isn’t really an online forum because I don’t know how many people set their comments to notifications of other comments…? It’s just a blog (and the most popular one I have ever published!). I hope you get the answers you need – but I worry about the black mold! on January 13, 2014 at 23:24 Bruce Hogan. Many thanks for the explanation, I appreciate it. I really hope you get better answers. But do watch the black mold! interesting to read your comment on the long cylindrical bag I have recently acquired a vintage one unfortunately minus the wooden tap but otherwise unused. They call them a verandah bag as they often hung under the verandah and had a much larger capacity than the standard water bag. This is the only one I have ever seen in my years of collecting water bags. In regards to the mould, a mild mix of bleach in water then thoroughly washed out with water then dried in the sun – dry heat, may help. I would personally throw it away (I don’t think mould in a canvas drinking vessel is good) and buy a new one there are quite a few makers of modern ones. With the new one when you finish using it make sure it is throughly dried and stored out of moisture as failure to do this is the most likely cause of the mould. I would have thought Wagga Wagga is fairly dry (if you still live there) not like Queensland where humid air may contribute to the problem. I would like to order a canvas bag. We used one many years ago on a farm. How do I go about it? When I was a young soldier in the British Army in the late ’60’s, I served in the Persian Gulf, where the chagul was common issue for field deployments. They would be soaked, filled, and hung on the outside of vehicles, where the movement assisted the cooling effect. A very old idea (originally from India, I believe) but very efficient.